New Lady Vols' head coach Kellie Harper and family are introduced to the fans at the Orange and White game Saturday at Neyland Stadium. 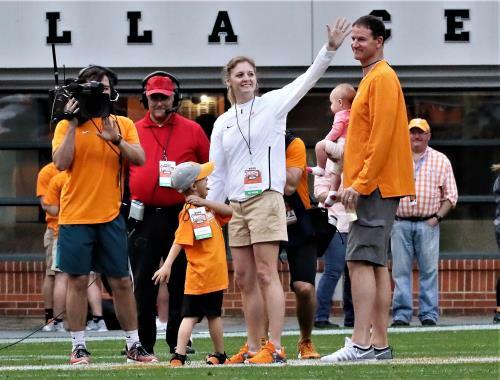 Harper, who had been coaching at Missouri State the past six seasons, was introduced as the Lady Vols’ new coach last week. She’s replaced Holly Warlick, who was let go after seven seasons. Warlick was a UT assistant when Harper played here from 1995-99. Harper’s life lately has been a whirlwind of activity, which is fine with her. Harper, who has 15 seasons of head coaching experience, said that her approach to offense differs from her UT experience. Defense and rebounding are not as different, other than perhaps the implementation. Harper was fired after four seasons as head coach of the Wolfpack and left with some hard-earned lessons about managing players and organizing a staff. “Any time you get let go, I think it rattles you, it does,” she said. “The best thing for me then was going to Missouri State, where I had unbelievable support. I really understand now how much that meant. UT’s point guard, who was critical of the previous coaching staff, has since put her name in the transfer portal. Harper was meeting with Westbrook on Monday to begin determining whether she will stay or go. Harper has conducted one team workout and so far, so good regarding the players. Regarding the roster, Harper said that she prefers having at least 13 players. Harper said that her husband, Jon, will be an assistant on her staff. She also is bringing in Jennifer Sullivan, who spent last season at Ohio State after serving five seasons on Harper’s staff at Missouri State. “She’s a superstar in the making,” Harper said of Sullivan. The remaining coaching hire, though, will be the top assistant on Harper’s staff. “I was pulling for Holly,” Harper said. “Two months ago, I was hoping that they would make a big run and win and everything would be very different now. It’s not that I didn’t want to be here. It’s not that. I wanted her to succeed. So I never did turn my sights to having this opportunity until (UT) called me after she was let go.